The first thing that Sal noticed was the girl’s hair. It looked like it belonged on a Raggedy Ann doll. She wore a brand-new houndstooth jacket and a black panne velvet skirt that gathered at her knees. Sal could tell by the way the girl fidgeted that she was as comfortable in her clothes as a baby in burlap. But at least her clothes were more flattering than the flapper duds most of the girls in school were trying to get away with. The redhead was holding a Grape Nehi in one hand and twirling a familiar charm by its leather cord in the other. “The amulet!” Sal and Rand exclaimed as one. “Is this what you boys were fighting over?” she asked. Sal rolled off Rand and both boys jumped to their feet. “That’s exactly what I figured,” the girl said, giving Sal a dirty look. She palmed the amulet and handed it to Rand. The boy stuck his tongue out at Sal. “No, wait! It’s mine!” Sal protested. The girl ignored him and pressed the object into Rand’s palm, closing his fingers around it. She held the blond boy’s eyes with her own. Rand nodded and stuck his fist into his pocket. He turned and scampered down the ladder, giving Sal a wink on his way down. “So long, sucker!” he taunted before disappearing beneath the edge of the marquee’s roof. “Of course I’m not all right!” he replied. His chest hurt like hell and his nose was bleeding. He touched the tip of his tongue to a cut on his lip and winced. Speaking only aggravated it. The girl scooped up a bit of snow and pressed it to Sal’s swollen lip. Sal didn’t reply. He was too busy trying to catch his breath. Rand had been right about one thing—he was definitely out of shape. “Well, at least wash your face with it,” the girl said. She snatched his wrist, turned his hand up, and plopped the snow into his open palm. The girl smiled and opened her hand. Sal’s pendant dangled from her finger on its leather thong like a yo-yo on a string. “A little sleight-of-hand my uncle taught me,” she boasted. The girl took a swig of her Nehi. She drained the last drop of the bubbly refreshment, wiped her mouth with her sleeve, and turned the empty bottle upside down. She handed the amulet to Sal. “Thank you,” he smiled gratefully. “That would be…ducky,” Sal smirked. Piper grinned at his remark. Sal then crouched to gather his fallen books. Piper knelt beside him and helped put them back in his satchel. “Wow! How much do you carry in this thing?” she asked. “How do you think I maintain this Charles Atlas physique?” Sal teased, striking a pose like the famous bodybuilder. Piper giggled. But she was right, of course. Sal kept his books with him at all times like they were his best friends. In addition to his school texts, he carried works of science fiction like The Island of Doctor Moreau, some dime novels by authors like Zane Grey and Bram Stoker, among others. 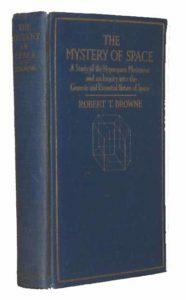 The Mystery of Space, by Robert T. Browne, is a synthesis of mathematics, hyperspace, Eastern religious philosophy, theosophy, and mysticism. Fearing rejection if the publishers knew its author was black, Browne concealed his race when he submitted the manuscript. Piper thumbed through one book called The Mystery of Space by Robert T. Browne. “Some people think so,” Sal winked. The redhead returned it to his satchel. Then she leaned over to pick up the book that had piqued Rand’s curiosity. It had fallen open during the melee and one of its pages caught her attention. “No, I mean this.” Piper pointed to a crude illustration of four jars with lids that looked like the heads of different animals. Sal scrunched his nose and took a deep breath. He pointed to the illustration. Sal moved his index finger across the page pointing to each of the jars in succession. His finger tarried on the final jar. “My uncle owns the falcon one and the jackal one,” Piper said with a smug expression. Then she closed the book and placed it neatly in Sal’s knapsack. “Stop looking up my dress, you cad!” she barked at him. At the bottom of the ladder, Sal was pressing his hand to the growing lump on his forehead when Piper jumped from the fourth rung and landed beside him. “You look a mess,” she said. “Oh, quit your bellyaching,” Piper said. She tossed a snowball at him and ran off. Sal followed in hot pursuit, but his own snowball missed its mark. 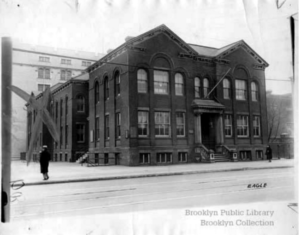 Then they took turns skidding down the slushy sidewalk all the way to the Flatbush School.